There are a lot of different options when it comes to hardware installation and upgrading your computer! With expansion cards, you can get better video quality, faster networking speeds, and even more USB ports or new styles of USB like the Brand new USB C! If your computer is running slow, freezing or crashing, it could mean that you need a memory upgrade. Installing a graphics card as seen in the picture to your left is an easy way to boost your systems graphical performance and bring higher quality images to your screen! 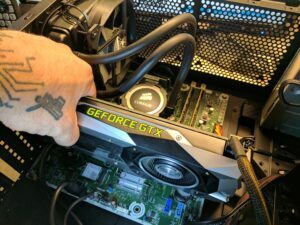 Scott is installing the GTX 1070 Founders Edition. PC getting a little too hot? You, my friend, could use some liquid cooling. Not only can your computer run faster, it stays cool in the process! Check this out, The Corsair Hydro Series Cooling H75 (This is the one seen in the picture) it does a great job under a stressful workload! Did you just get a new Digital Camera and the pictures you are taking are really starting to fill your hard drive up? You might just be a prime candidate for a new hard drive. You have mastered the art of burning your own CD’s and now you are ready to try out DVD’s… That has optical drive upgrade written all over it. Whatever the reason, whatever the want. If you want your Hardware installed and configured the right way every time, visit the Northwoods Computer Guy. Questions about what you need? Your Northwoods Computer Guy can even find the perfect part for your computer, order and install it for you! Keeping your computer up to date has never been so easy!